The gadgets come thick and fast in FRWL and next up is the pager and car telephone combo. It’s all fairly rudimentary, but you can be assured that no-one in your street had one back in 1963. 1) 20 rounds of ammunition at either end of the base. 2) A flat throwing knife that pops out of the side. 3) A .25 AR-7 folding sniper’s rifle – that should sort out a few problems. 4) And don’t forget the infra-red telescopic sight, just in case the baddie makes a run for it. 5) 50 gold sovereigns hidden behind straps. 6) For the best bit, we will pass you over to Q: “Now, watch very carefully. An ordinary tin of talcum powder. Inside, a tear gas cartridge.” It’s even magnetised. 7) To activate the sneaky talc bomb, you just need to flip the catches on the briefcase horizontally. 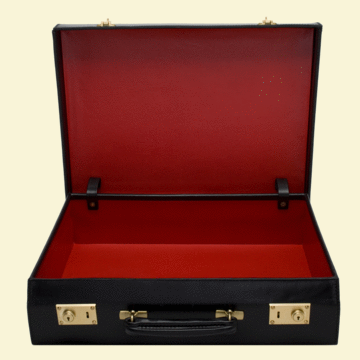 You can buy a copy of Q’s marvellous briefcase from the original manufacturer, who was referenced in the Ian Fleming book. 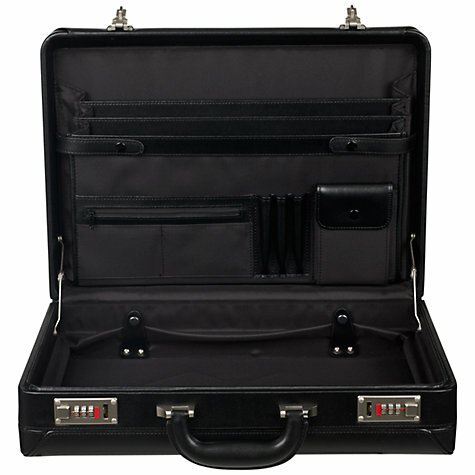 Swaine Adeney Brigg’s attaché is available for just £1,675. The company, formed in 1750, has also been responsible for a variety of Bond hats and caps, Indian Jones’ legendary hat, and Steed, from the Avengers, hat and umbrella. The rifle is currently available in America, but obviously not in Britain. From our experience, if you open a tin of talcum powder, it blasts into your face whether you like it or not! 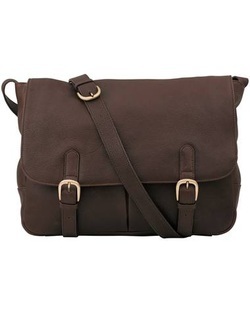 Another example of a premium quality leather briefcase, but not nearly as expensive, is this tan leather messenger bag from The Savile Row Co. At £99.95, it is far less expensive than the design used for From Russia With Love, but the quality remains similar. At a similar price, and more commonly seen today, is the slightly more modern design on the right.